Mayer Brown has an expansive network of partners who have held top government roles around the world, and most recently represented Société Générale in an internal FCPA investigation. The firm’s investigations practice advises clients on a wide variety of high-profile matters from the Department of Justice’s Swiss bank programme to the recovery of the largest known emerald in the world. 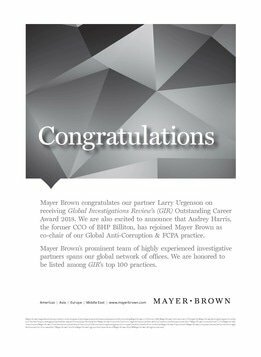 Mayer Brown has particular prowess in Foreign Corrupt Practices Act matters thanks to partner Laurence Urgenson. Urgenson is a key partner at Mayer Brown and is a leading foreign bribery investigator who co-heads the firm’s anti-corruption and FCPA practice. Urgenson has represented six companies in FCPA settlements since the Siemens case in 2008 – more than any other lawyer – bar one. He is also a Who’s Who Legal: Investigations. Working alongside Urgenson is his protégé Matthew Alexander, a GIR 40 under 40 nominee for 2017. Recent additions to Mayer Brown’s investigations practice include former Manhattan federal prosecutor Glen Kopp and partner Nicolette Kost De Sevres who heads the compliance team in Paris. Kost De Sevres was special senior counsel in the New York Stock Exchange’s Paris office as well as senior special counsel at the Royal Bank of Scotland in London. Kopp served in the Southern District of New York under former US attorney Preet Bharara. As a prosecutor, Kopp investigated a group of US-based Russian agents in an operation known as the Illegals Program, which was partly the inspiration for the television series The Americans. Alan Linning, previously the executive director of the enforcement team at the Hong Kong Securities and Futures Commission, recently joined the firm in Hong Kong. Another addition, Michel Sancovski, joined Tauil & Chequer Advogados, an associated firm of Mayer Brown in Brazil. Sancovski has had a central role in cooperating with Brazilian and US authorities, as well as in negotiating leniency agreements. Mayer Brown announced the hire of two white-collar partners from Norton Rose Fulbright, Sam Eastwood and Jason Hungerford, in July 2018. Eastwood joins the firm after almost three decades at Norton Rose. Hungerford previously worked on the investigation into Swedish telecoms company Telia, which resulted in an almost $1 billion settlement with US, Swedish and Dutch authorities in 2017. Another name to know at the firm is Daniel Stein, who joined Mayer Brown in 2016. Stein is a former chief of the criminal division in the US Attorney’s Office for the Southern District of New York. Under his tenure, the SDNY brought diverse cases, including a US$795 million global settlement in February 2016 with telecommunications company VimpelCom. Mayer Brown also relies on Washington, DC based partner Richard Ben-Veniste who was one of the lead prosecutors on the Watergate Special Prosecution Force. In another prominent government probe, Ben-Veniste was chief counsel of the Senate Whitewater Committee which investigated the Clintons’ real estate dealings. The firm lost a key partner to the Trump administration in 2017. Washington, DC-based John Sullivan was confirmed in May 2017 for deputy secretary of state. He became the acting secretary for a period in April 2018 after Rex Tillerson was fired and before Mike Pompeo took over. Urgenson and Alexander represented casino hotel company Las Vegas Sands in its recent FCPA settlements with US authorities. The firm advised Las Vegas Sands in its April 2016 SEC settlement. A former executive at the company alleged that the owner of Las Vegas Sands authorised a questionable US$700,000 payment to a legislator in Macau. The company did not admit or deny the SEC’s findings, and agreed to pay US$9 million in civil penalties and retain a monitor to settle the allegations. Then in January 2017, the company settled with the DOJ for US$6.96 million to resolve the matter. The non-prosecution agreement appeared to cover the same misconduct cited nine months earlier in the SEC’s settlement. GIR has reported that Mayer Brown represented French bank Société Générale in its internal investigation into FCPA violations. In the first-ever coordinated resolution with French and US authorities, the bank agreed to pay $1.3 billion for bribing Gaddafi-era Libyan officials and manipulating Libor. The firm was also counsel to Société Générale over the US Libor manipulation agreements. Société Générale resolved allegations with the DOJ and the Commodity Futures Trading Commission that several employees falsely deflated US Libor submissions. The case was a landmark moment for foreign bribery enforcement as it was the first joint resolution between authorities in the US and France. In addition, Société Générale’s lawyers were able to tie up different forms of conduct, bribery and benchmark manipulation, in a single resolution – a dream scenario for any client facing legal jeopardy on multiple fronts. And according to GIR Just Anti-Corruption’s FCPA Counsel Tracker, Urgenson is the monitor overseeing Chilean airline LATAM. The company retained a monitor for three years under its $22.2 million agreement in 2016 to resolve allegations it bribed Argentine union officials to obtain favourable labour contracts. The award of the monitorship to Urgenson demonstrates the sterling reputation he has both in the defence bar and in government (the company has to nominate three candidates and the DOJ picks the individual it believes is best suited to the role). Mayer Brown is a global firm of more than 1,500 lawyers in 24 offices, almost all of which host investigations partners. Mayer Brown has a formal association with one of Brazil’s largest firms, Tauil & Chequer Advogados. One of the firm’s Brazilian partners includes Luís Inácio Adams who was previously the minister and attorney general of Brazil. The firm has bolstered its global network through mergers with one of the largest law firms in Asia, Johnson Stokes & Master, as well as numerous European outfits. While many of the firm’s current clients are confidential, it has advised the Rezidor Hotel Group, Toronto-Dominion Bank and trading company Mitsui Brasil Co.
Credit Agricole, KBL and PostFinance. Meanwhile, Mayer Brown’s Kelly Kramer represented the former vice president of New Jersey-based Louis Berger International, which admitted in 2015 to FCPA violations and agreed to a $17.1 million deferred prosecution agreement. The DPA resolved charges that the company bribed foreign officials in India, Indonesia, Vietnam and Kuwait to secure government construction management contracts. James McClung, who was responsible for the company’s operations in India and Vietnam, was sentenced in 2016 to a year and a day in prison for FCPA violations. In London, Mayer Brown represented construction company Sweett Group over an investigation by UK authorities into foreign bribery allegations. The company later changed firm to improve relations with the Serious Fraud Office, according to court filings from February 2016. In February 2017 Sweett Group was convicted of UK Bribery Act violations and ordered to pay £2.25 million. Mayer Brown has also been helping the government of Brazil to recover the “Bahia Emerald”, a gem worth approximately $400 million. The emerald was recovered in Los Angeles in 2008, and has since been bitterly fought over by several parties. Mayer Brown was instructed by the Brazilian government to help repatriate the emerald. Mayer Brown is a global legal services provider advising clients across the Americas, Asia, Europe and the Middle East. We are noted for our commitment to client service and our ability to assist clients with their most complex and demanding legal and business challenges worldwide. We regularly represent and counsel companies and individuals on a wide range of multinational investigations and litigations such as matters involving the FCPA and other global anti-corruption efforts, internal investigations, DOJ/SEC or foreign investigations and enforcement proceedings, compliance reviews, and due diligence regarding mergers and acquisitions. Our cross-border investigations capabilities are strengthened by our global presence, with regional offices and partners in Asia, Europe, the Middle East and South America. Where knowledge of local laws is required, we work closely with colleagues in our international offices to ensure compliance with any applicable local laws and regulations. Our team includes numerous former government officials, including many who held high-ranking supervisory positions, federal prosecutors from US Attorney’s offices around the country and lawyers from international and federal regulatory agencies. For example, our team includes a former acting deputy assistant attorney general and chief of the DOJ’s fraud section; a former executive director of the enforcement team of the Hong Kong Securities and Futures Commission; a former assistant chief litigation counsel of the US Securities and Exchange Commission; a former deputy enforcement director of the Consumer Financial Protection Bureau; the former chief counsel of the US Senate judiciary committee; and chief of the Watergate Task Force. We also boast former UK Financial Services Authority lawyers and the former attorney general of Brazil. Please visit www.mayerbrown.com for more information.